The Asian elephant, known to scientists as Elephas maximus, is just one of Earth’s two elephant genera (a classification above species). The other is the African elephant, officially known as Loxodonta africana. Asian: Fewer than 50,000 animals in Southern Asia; parts of India, Sri Lanka, Myanmar, Thailand, Laos, Cambodia, Sumatra, and Indonesia. African: About 600,000 living in most African countries, excluding the Sahara and the rainforest of the Congo. Primarily found on protected reserves. Asian: Females, or cows, grow to be 9 feet tall at the shoulder and weigh up to 8,000 lbs. ; males, or bulls, grow to be 10 feet tall at the shoulder and weigh up to 10,000 lbs. The highest part of the body is the head. African: Females, or cows, grow to be 10 feet tall at the shoulder and weigh up to 10,000 lbs. ; males, or bulls, grow to be 12 feet tall at the shoulder and weigh up to 12,000 lbs. The highest part of the body is the shoulder. Both species use their trunks — which contain more than 40,000 muscles — to pick up food, to act as snorkels when swimming, and to spray water when taking a bath, as well as for smelling, touching, and grasping. Asian: Have a single “finger” on the upper tip of their trunks. African: Have two “fingers,” upper and lower. 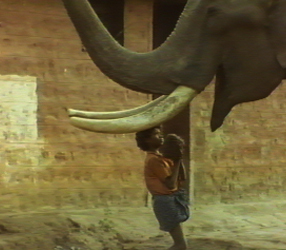 Specialized teeth that keep growing throughout the elephant’s life. Used for digging up roots and fighting. Asian: Only some males have tusks; those with tusks sport relatively small ones, usually less than 3 feet long. African: Both female and male elephants have relatively large tusks. Largest known is more than 11 feet long and weighs 236 lbs. In addition to hearing, elephants flap their ears to lower the temperature of their blood and cool themselves down. Asian: Relatively small, triangle-shaped ears folded back along the head. African: Larger ears often splayed away from the body like wings. 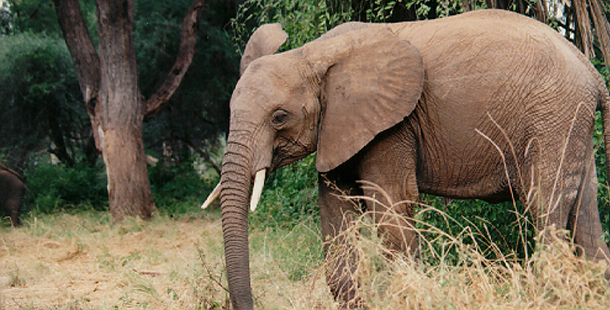 Since African elephants live in hotter areas, their ears are larger in order to provide maximum cooling. Asian: Rounded or flat backs. Asian: Two lumps, or domes, on their skulls. Asian: Female Asian elephants are commonly used in circuses and kept in zoos; they are considered relatively easy to train. African: African elephants are thought to be harder to tame, though they have been domesticated for labor in some African nations. The famous circus elephant Jumbo was a male African elephant.